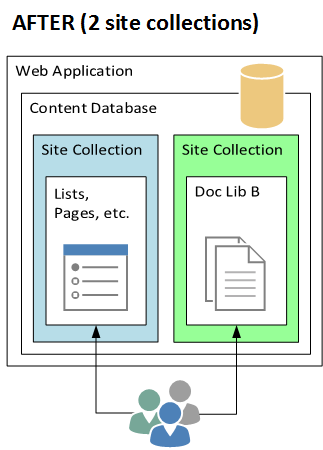 A site collection starts our small at first, gets popular, explodes in size seemingly overnight, and the SharePoint admins scramble to support it. Sound familiar? It can be helpful to peel out a large Document Library into a dedicated site collection. Then you have more options via PowerShell and SQL to manage backups. Have five document libraries with 100GB each? 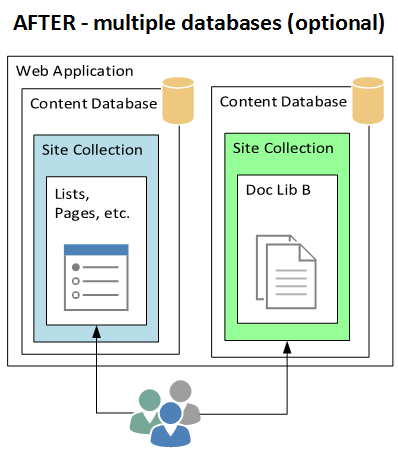 Fine, split them out to 5 site collections in 5 SQL databases. Very manageable. 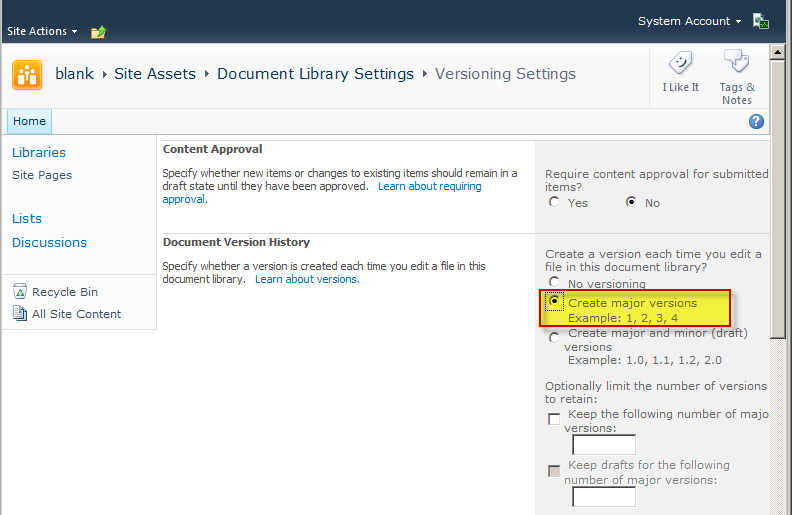 1) Make a new SQL content database (optional). If you know LOTS of content will be coming, then give it room to grow now. 2) Make a new blank site collection. The below PowerShell command can help direct the site creation to a new database. I like to use STS#1 for “Blank Site” because it has a minimal simple footprint. Less is more. 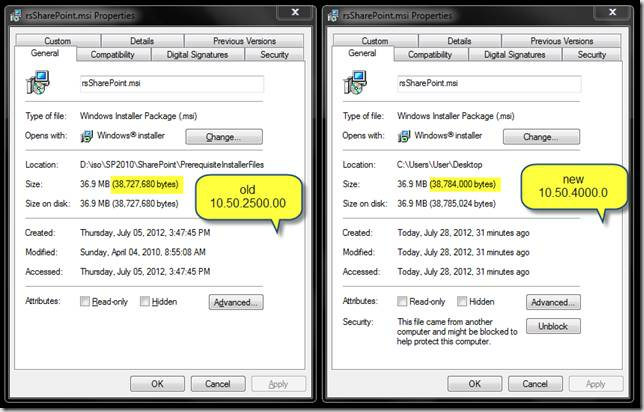 http://spdeploymentwizard.codeplex.com/ can be used for a friendly safe GUI to export with all the right options. I like to enable checkboxes for ALL security, ALL versions, and ALL user info. 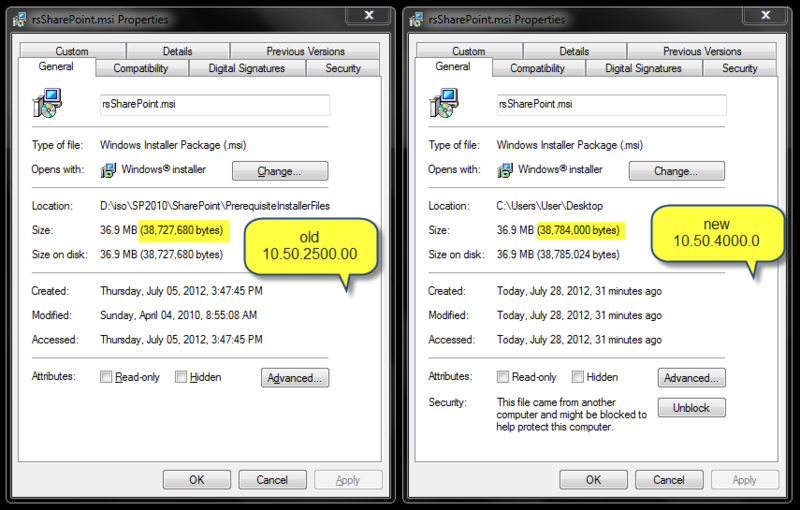 http://spdeploymentwizard.codeplex.com/ can be used for the import too. 5) Delete the original Document Library. Manage two sets of security. Yes, you’ll have to grant people permissions in two places. Even using SPGroups won’t help because those are scoped to one site collection. AD groups can help. Those would be a great way to grant security to many site collections at once. All about scale. With only 2 sites AD groups probably aren’t worth the trouble, but with 20 it sure would help. Sandbox code solutions. These only run in 1 site collection, so if you’re using them to manage documents and move those document libraries you could see issues. The workaround would probably be to upgrade the code to a Central Admin farm WSP solution. Dependency. 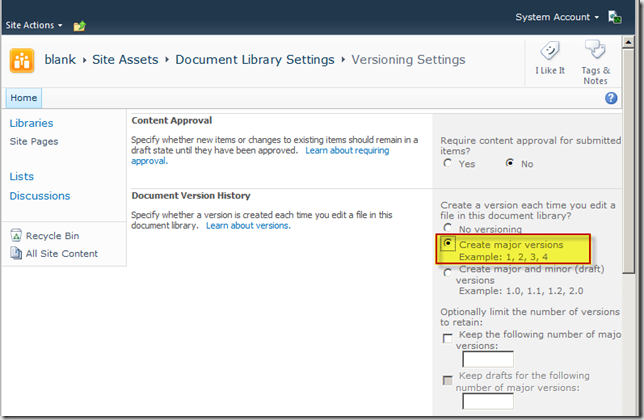 For some migrations you’ll need to copy ALL site collections. If you copy just 1 then you may have broken links or missing dependencies. 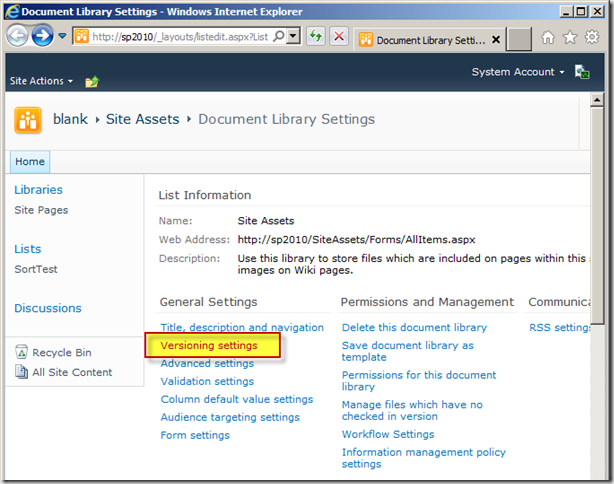 One thing I like to do on a newly created site is enable Version History for the “Site Assets” document library. With many CSS and JS files supporting front end development, often those code files land here. 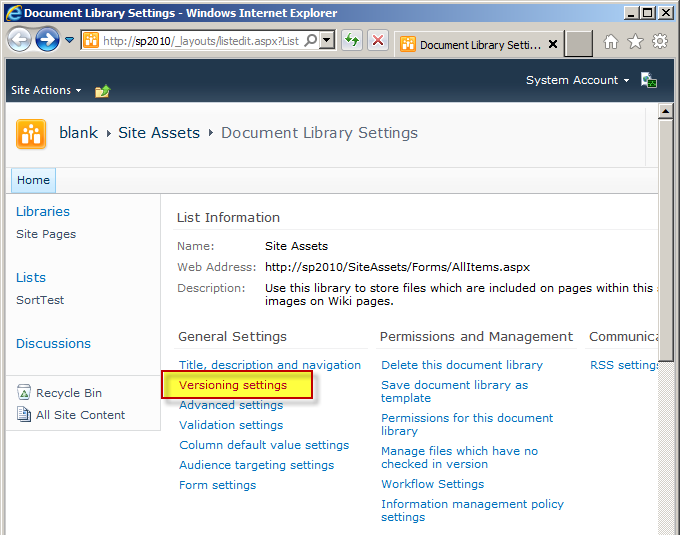 SharePoint Designer can be used to quickly check this setting. “Site Pages” will have Version History enabled by default on newly created Team Sites. 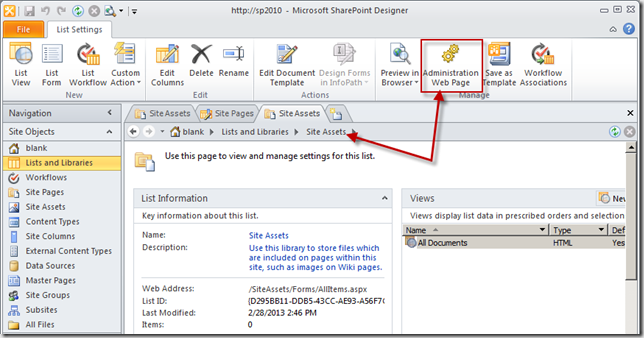 That covers ASPX pages, but it can be smart to enable both for safety. Recently I needed to empty an InfoPath Form Library by deleting all of the items and skipping Recycle Bin. Datasheet view is great for small lists (a few hundred rows) but it doesn’t perform as well on large lists. Also, skipping the Recycle Bin is a unique requirement best handled with server side code. 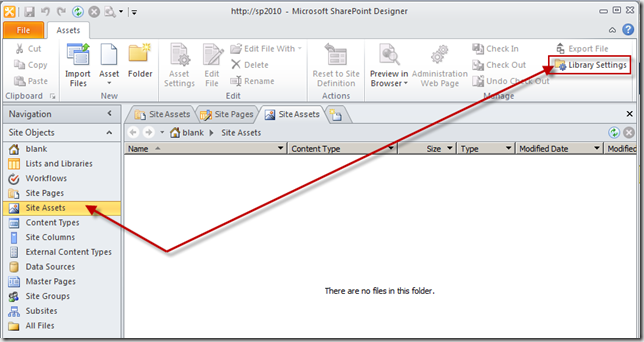 See the below PowerShell script for how to easily “empty” any SharePoint list or library. 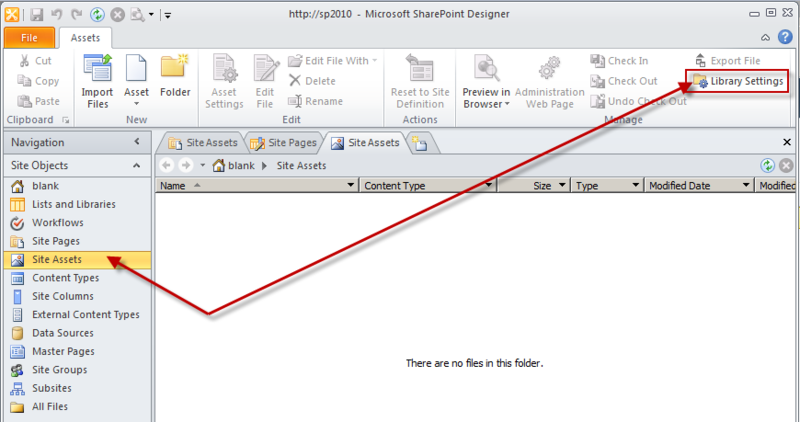 This works with both SharePoint 2010 and SharePoint 2007 (MOSS 2007). NOTE – Use this script carefully, it is really good at deleting.